The link between Batman: Arkham Origins and its inevitable tie-in comic book series may extend beyond simple narrative similarities. Here's the situation: Batman: Arkham Origins, the latest entry in the Arkham franchise initially created by Rocksteady Studios, hits all of our major, current platforms on October 25. This being a game based on Batman, it should go without saying that DC Comics would want to aid in the marketing blitz by publishing a related comic book series. That's just good business. Better business? That'd be creating a digital comic book tie-in with the potential to interact with the videogame. While it's nice idea, it's not exactly confirmed. 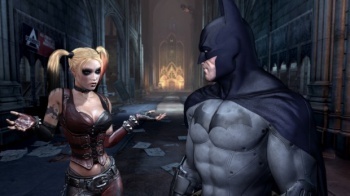 Polygon recently interviewed Warner Bros. Games Montreal producer Ben Mattes, and in the course of the chat Mattes was asked point-blank how linked the game and comic book might be, and if the two would have technological hooks for one another to play off of. "They definitely tie-in narratively. That's a given," Mattes states. "There are talks that are underway right now to see whether or not there's an opportunity to do something a little bit deeper than that." "No guarantees, no promises yet," Mattes quickly adds. "It's definitely on the radar, to see if we can put some interesting hooks in there, but we'll see if we can get it done in time." We aren't going to know the extent of interactivity between Arkham Origins and its comic book pal until much closer to their release, but that does offer ample time for us to discuss how we'd like this interactivity to play out. Normally this is where I'd offer my own example to spark said discussion, but I'm drawing a creative blank here. Maybe one could earn new items and unlockables by finishing the comic book? Maybe certain boss fights or areas will only be accessible to those who reach certain story beats in the comic? The more I think about this the more all of these ideas sound irritating and gimmicky, so please, if you have a good use for this concept, share it in the comments.